In what country is Ace Jackalope? What part of that country might he be visiting? What might he be looking forward to consuming in that building behind him? 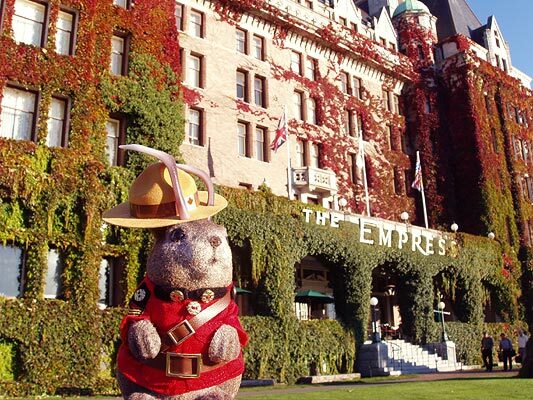 It is the Fairmont Empress Motel in Canada. British Columbia to be more exact. As far as eating, how about afternoon tea since this is motel in the finest English tradition! I am hoping at least! Afternoon Tea it was, indeed...not all that photogenic so it's pretty low on the blogging priority list...then again, my tea-inclined friends tell me it was a big deal. They really need big insulated mug for tea, though...and little weiners...and buffalo wings...think they'd take kindly to the suggestion?